this look was a fun one and i really loved wearing it. i borrowed all the polishes so i don't have pics of the bottles unfortunately tho. the main color is prince charming by orly, part of the once upon a time collection. it is a pretty creme chocolate brown color, which i didn't think i would like that much actually with my skin tone. (more on that later) the stripes are done with art club (?) or art deco or something nail art brushes in standard white and black. there are possibly different names for them but like i said, i borrowed them so i can't remember. the first shots are with seche as a topper. now i like this look alright, but meh, i didn't think it was anything special. and i actually only did the stripes on the sides because i messed up and peeled some off my right thumbnail on the side and i didn't want to paint it over, so i decided to decorate them instead. 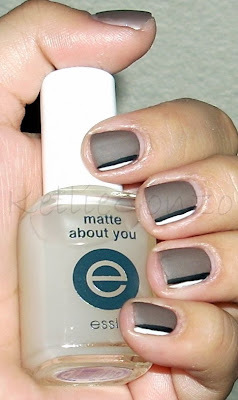 but when i got home i put on a coat of essie's matte about you matte-maker top coat to try it out (new purchase!) 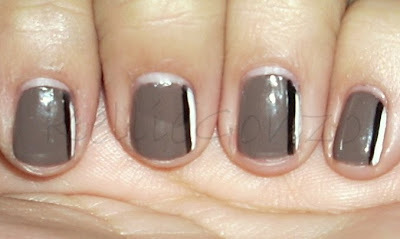 and WOW it absolutely transformed this mani for me! idk about you but after it went matte, it went PHAT haha. the topcoat lightened the brown a bit which made the polish suit my coloring much better i think. it also like flattened and blended the polishes all together into a satin-y way and i just absolutely loved it. what do you guys think?? mmm i just went to texas roadhouse for dinner with some friends and i am STUFFED to the brim with yummy rolls and delicious mashed potatoes and new york strip steak. so i'm gonna sluff off and get some sleep! i start fall semester tomorrow (YIKES!) and its finally all psychology classes!! yayay no more math :D wish me luck and i hope everyone is having a lovely week so far.